I want to thank Laura Canale, whose paper-crafted baskets inspired me to make my own simpler version. 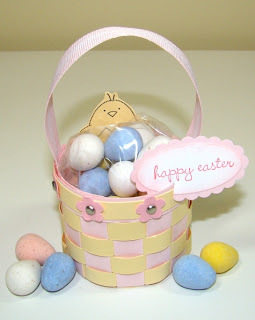 When you have mastered my flat-bottomed basket, you may want to give Laura’s baskets a whirl. 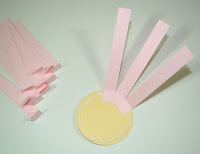 Step 1: Bend the fourteen Pirouette Pink Stake pieces at the ½” score mark. 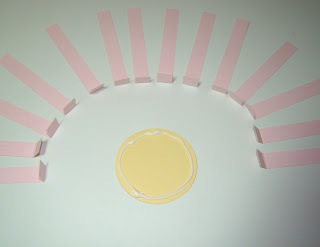 Squeeze a line of Tombow Multi glue around the perimeter of one of the Barely Banana circles. 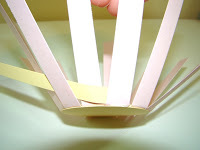 Step 2: Start placing the stakes around the edge of the basket as shown. Make sure that the edge of the stake is flush with the edge of the circle on the outside. The ½” tabs will over lap a bit on the circle. This is fine as they will be covered up later on. 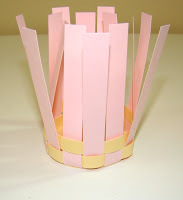 The stakes will look like this when they are all glued on. 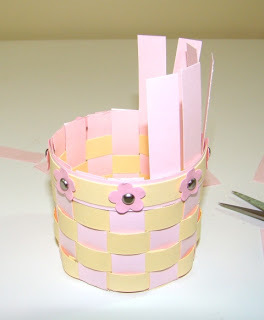 Step 3: Spread glue all over the bottom circle of the basket. Place the second Barely Banana circle directly on top of the other one. 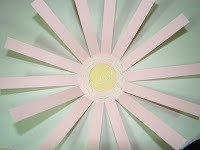 This second circle will secure the stakes and give the inside bottom a finished look. 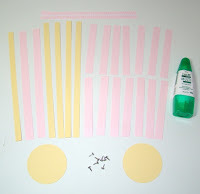 Step 4: You can now begin the weaving process. 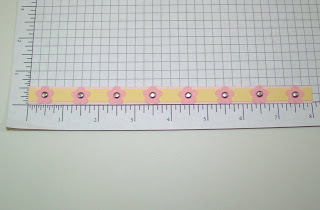 Take one of the four 3/8” x 8-½” Barely Banana strips and place a mini glue dot on one end (this will help anchor the first round, the subsequent rounds can be done without the aid of mini glue dots). 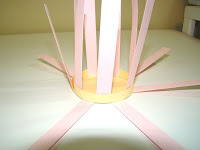 Attach the end of the strip to the inside of one the stakes. Weave all the way around. When you reach the end of the first round, make sure that you tighten the weave sufficiently such that it is neither too loose nor too tight. You may then secure this piece with another mini glue dot. Now weave the remaining three strips around. When you are weaving without the help of mini glue dots, keep one hand on the beginning of the strip as you weave the end with the other hand. You should have a little overlap at the end of each weave strip which you can just tuck in. Step 5: When you have woven all four strips, you can straighten and align the strips by pressing gently down on each row in turn, starting from the bottom row and working your way up. This will make the weaves look a little neater. 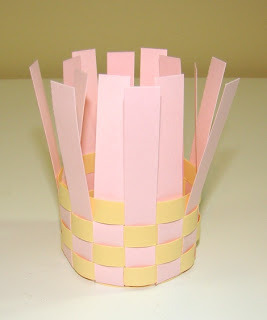 Step 6: For the basket edge piece, adhere the 3/8” x 8” Barely Banana Strip Layer onto the ½” x 8” Pirouette Pink Strip. Pierce 8 holes along the strip one inch apart starting at the ½” mark. 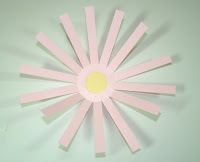 Push brads through all eight holes and flatten out the ends (you can add flowers for decoration if you wish). Place sticky strip all along the back of this strip. Step 7: Remove the sticky strip liner and adhere edge piece around the top of the basket directly above the last woven round. You may need to trim the strip a little where the two ends come together. Step 8: Trim off the ends of the stakes or vertical pieces. 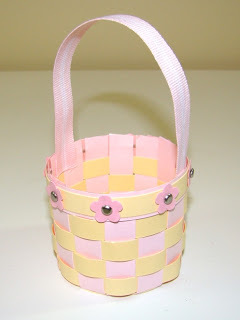 Step 9: Adhere a 7” length of Pink Pirouette Grosgrain Ribbon to the basket with sticky strip to form a handle. 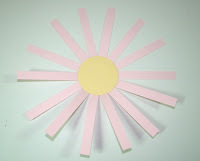 Step 10: Place sticky strip all along the back of the ½” x 7-½” Pirouette Pink Strip. 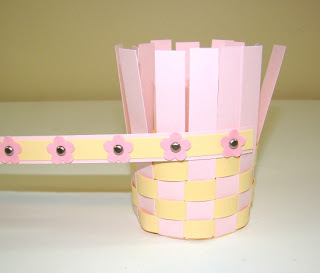 Remove the backing from the sticky strip and carefully wrap the strip around the inside top edge of the basket to hide the ends of the basket stakes and ribbon handle. Finally, decorate as desired and remember to HAVE FUN! !